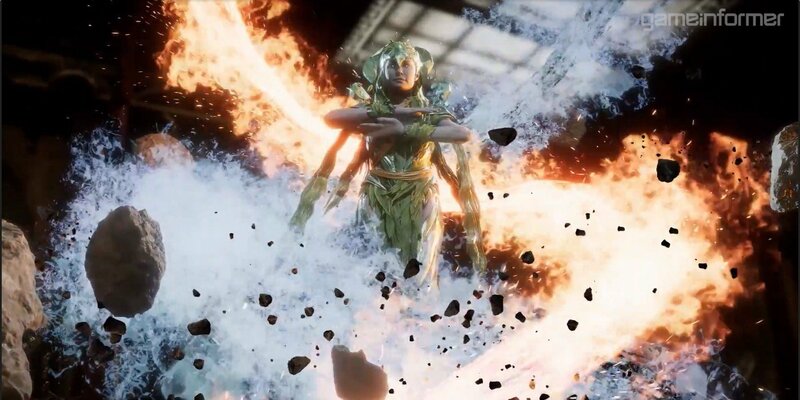 Mortal Kombat 11 is getting its second brand new character to the franchise in the form of earth goddess Cetrion. Mortal Kombat 11 is weeks away from releasing on PC and consoles, but NetherRealm is continuing to roll out roster reveals ahead of the game's release. To this point, many of the character reveals have been familiar faces. They're characters that have either been featured in Mortal Kombat X or Mortal Kombat (2011) before it. But it looks like Game Informer is teasing an entirely new entry into the Mortal Kombat franchise. Game Informer revealed on Tuesday that Cetrion would be the next character to crack the MK11 roster. Who is Cetrion? Not much of this character's backstory is revealed, though she appears to have the power of the gods of this world. While Raiden works as the God of Thunder, Cetrion comes across as a Goddess of Earth. As such, Cetrion's abilities include manipulating the land and its many elements to aid her. Her arsenal mostly revovles around plants and rocks, but her moves also take advantage of water, ice, lightning, and fire to put the hurt on her opponents. She can hit opponents from a distance by dropping rocks on them, but she can also use command grabs to flay them with fire. Cetrion's Fatality is one of the more cartoonish ones to hit the game so far, with the goddess growing to titanic size and firing down a beam that leaves the opponent a flying mass of body parts. Her character trailer isn't officially on YouTube just yet, but you can catch the whole thing at Game Informer. Look for more details on Cetrion to arrive in the weeks ahead, both from the Game Informer cover story and also from NetherRealm's own KombatKast live streams. Those details will likely cover more of Cetrion's combo potential, as well as her backstory and how she ties to the upcoming MK11 Story Mode. Mortal Kombat 11 is set to arrive on April 23. It will release on PC, PlayStation 4, Xbox One, and Nintendo Switch. These games keep getting less realistic, such a shame.